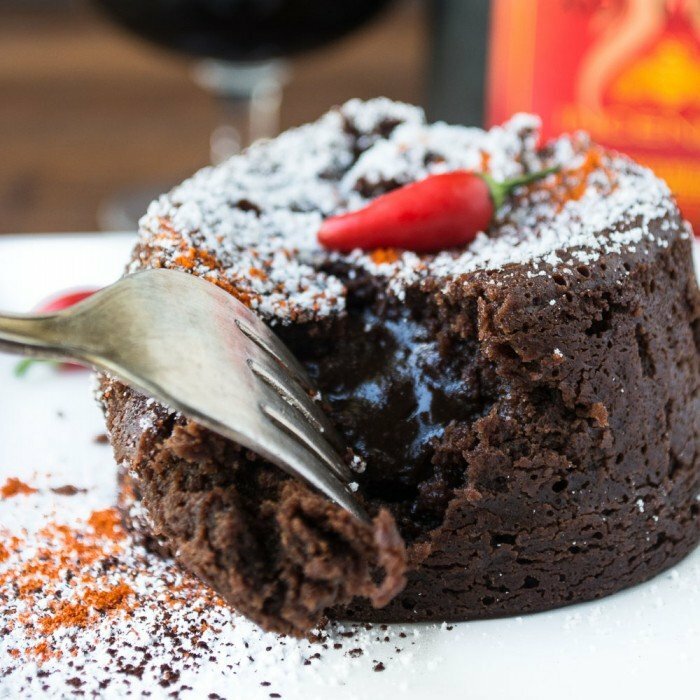 Patrón Incendio Molten Lava Cake is a voluptuous dessert with the surprise kick of chocolate chile liqueur! This dark chocolate dessert never fails to elicit oohs and aahs. Thank you Patrón for sponsoring this post. Visit your local retailers to pick up your own bottle of Patrón XO Cafe Incendio and please remember to drink responsibly. If you have kids, I’ve got a pretty good idea of how you’ll be spending your Halloween next week You’re probably stockpiling big bags of candy. Maybe you’ve stretched some fake cobwebs over your front yard shrubs. Probably also got those cute polyester costumes out of their bags and ready to go. But for those of you who are pre or post kids, Halloween takes on a totally different vibe. Let’s be honest, even if you have kids, there comes a time when you just have to turn off the porch light and call it a night. 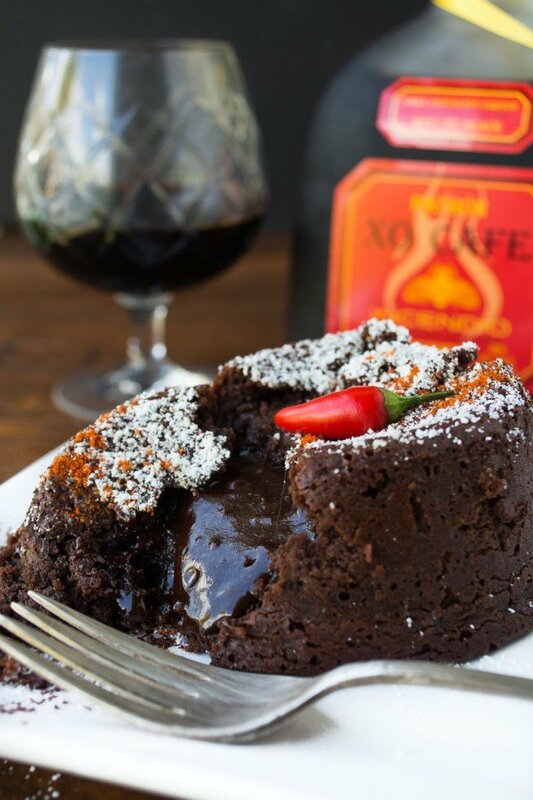 That’s where this wickedly decadent Hot Lava Cake spiked with Patrón XO Cafe Incendio comes in. It bakes up in an incredible 13 minutes, and will be the highlight of your after hours Halloween, guaranteed. Just a heads up — this isn’t your typical everyday cake. For one thing, when you stick your fork into it you’ll unleash a molten river of chocolate from its center. And if that isn’t enough excitement for you, every bite has a surprise sweet fiery finish. 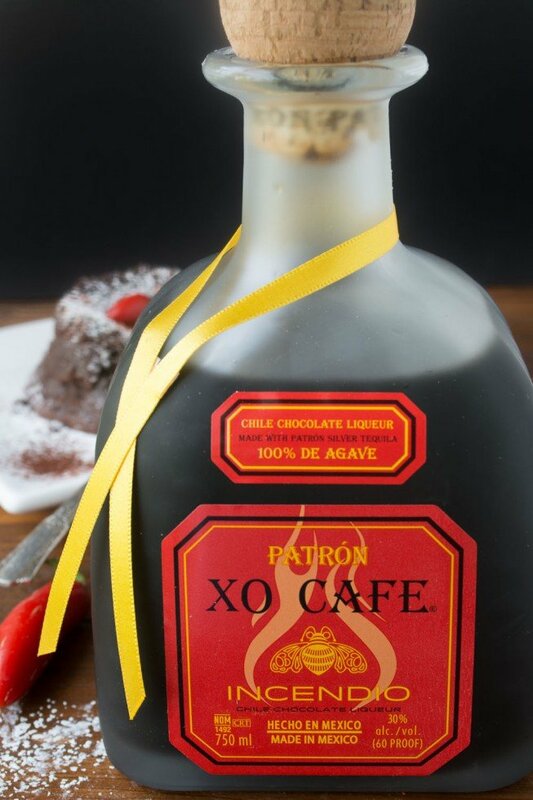 My secret ingredient is Patrón XO Cafe Incendio, a bold chocolate chile liqueur with a smooth tequila base. It’s made with rare Criollo cocao beans (less than 1% of the world’s production) and Mexican arbol chiles. Oh, and of course, Patrón. Silver Tequila. We love it straight up, after dinner, but this cake takes it to a whole new level. Make it to impress your friends, seduce your significant other, or just satisfy your curiosity, but whatever you do, try it! This impressive looking dessert is actually very easy, so even if you’re not a crackerjack baker, you can do this, trust me. I’ve set out simple step by step instructions and I’ll walk you through it, it’s actually one of the easier desserts you can make. The concept is simple — the cake is cooked just long enough to set around the edges but remains liquid inside, ready to erupt at the touch of a fork. 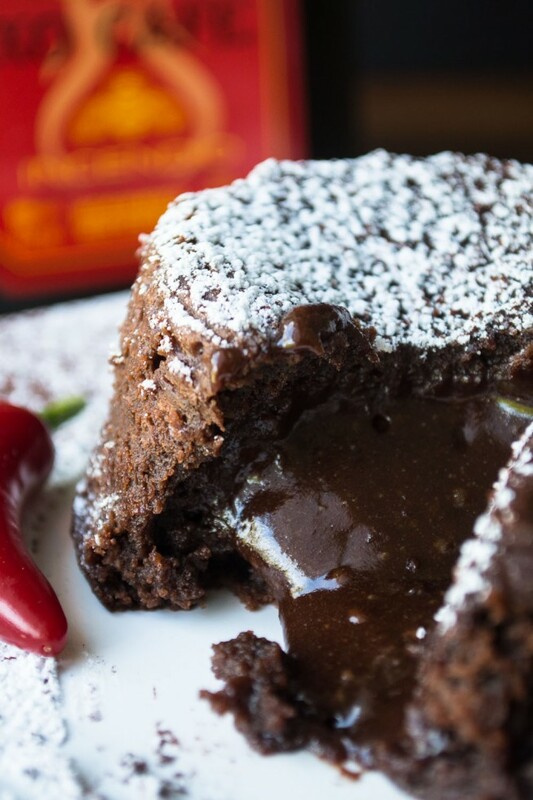 In this case, that gorgeous molten chocolate has quite a spicy punch, too, thanks to Patrón. I garnished my cakes with a dusting of powdered sugar and cocoa powder, but you can also add a pinch of cayenne if you like. The small red chile peppers came from the farmers market, but you can sometimes find them in the grocery store. I like to add them because it gives the diner a heads up that what they’re about to enjoy is a bit…spicy. Another way to serve the cake is with a dollop of whipped cream or a small scoop of ice cream to play against the warmth of the cake. Don’t get the wrong idea, though, this cake isn’t super spicy. It’s got a nice gentle heat. Leave out the cayenne pepper altogether if you prefer. I hope you give this cake a try, it’s quite an experience! And as a bonus you’ll have some Patrón XO Cafe Incendio around for drinking. We like to sip it, just as is, but there are a million cocktails you can make with it. The Patrón site has some great ideas, here. Put the butter in a sauce pan and melt it over low heat. Turn off the heat and add the chocolate. Stir until the chocolate is completely melted and smooth. If necesarry put back on low heat just until the chocolate is melted. Whisk in in the eggs, blending well, and then the sugar. Stir in the Patrón, then add in the cayenne pepper and the flour. Stir just until completely mixed. Butter 4 ramekin cups really well. Cover the entire surface liberally. Divide the batter between the cups and set the cups on a baking sheet. Bake for 13 - 14 minutes. The cakes should be firm around the edges and dry looking on the top. Remove from the trays and let sit for a minute or two, but no longer, as the cake will continue to cook as it sits. Run a slim spreading knife gently between the cake and the cup to loosen it, and then invert onto serving plates. Dust with the sugar, cocoa powder, and cayenne, if using, and serve immediately. This cake is easy but the details are important. Think of it as your final high school chemistry project — follow every step carefully — and no substitutions! Size matters. The eggs should be large, not medium, or extra large. And the recipe is formulated for four portions. I used 6-ounce ramekins. They measure 3 inches in diameter. You can find them in cooking or home goods stores, and online. These are the exact ones I used (the 6 ounce.) Yes you can use slightly different ramekins, but the baking time will be different and you’ll have to experiment to get that perfect lava flow. Temperature matters, too. So many baking projects fail simply because the oven is not at the right temp. I tested this recipe several times and one of those times I accidentally set my oven to 350F instead of 400F. Let’s just say it didn’t work. Get an inexpensive oven thermometer so you can know for sure what temperature you’re baking at. One of the really great things about this recipe is that you can make the batter ahead of time. Leave it covered at room temperature for as much as a few hours ahead. Do not refrigerate it, the batter needs to be at room temperature to bake properly. 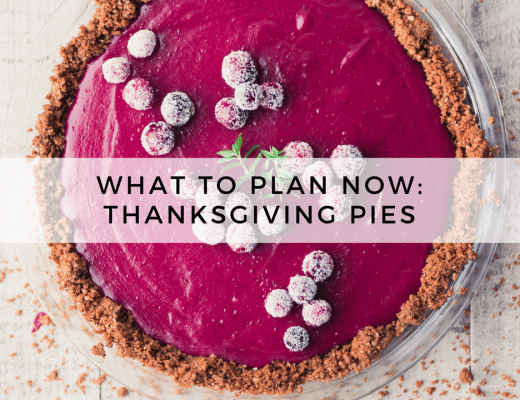 The cakes will continue to cook even after they come out of the oven, so have your garnishes ready to go so you can plate the cakes quickly — you don’t want the lava to firm up! If you’re cake comes out with a little divot or two missing, just patch it together and disguise it with the powdered sugar! 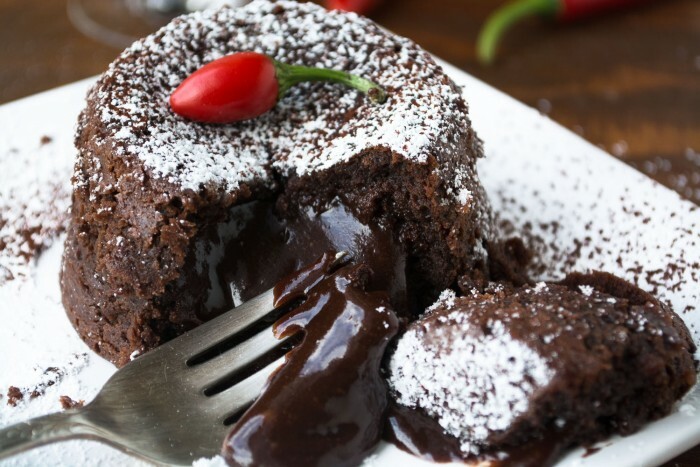 Don’t forget to pin this Molten Lava Cake! I’m looking forward to trying these this weekend. Are you sure about the two extra egg whites? Every other recipe I’ve found for lava cake calls for the addition of extra yolks, rather than whites, to the whole eggs. I’m super embarrassed, but I checked it and I think you’re right Amelia, I corrected the recipe. Yikes, I apologize! I really didn’t think lava cake could get any better than it already is but you managed to do that with booze! This looks absolutely amazing!! I’m a huge fan of sweet heat, so I know I’d love this! YUM!!! I’m pretty sure we bought a bottle of that to share with our friends the last time we vacationed together! 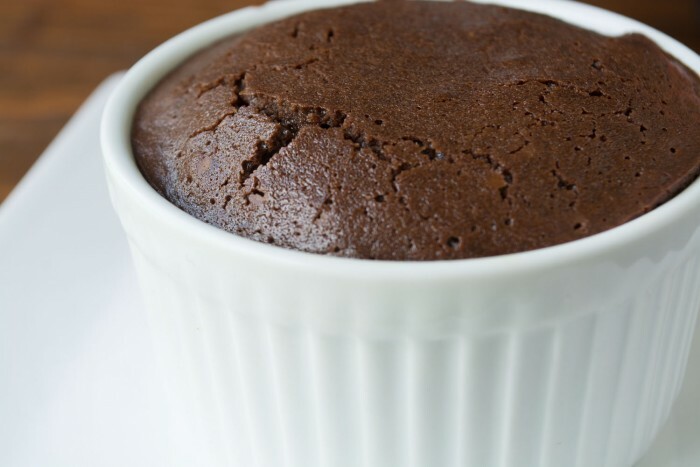 It did have a kick :) What a wonderful way to use it in this lovely molten chocolate cakes. How I love chocolate! Stunning photographs! I love the kick from cayenne and the Patron liqueur. This would be such a treat for guests. Molten Lava Cakes are my weakness…these look so incredibly perfect. I want to dig right in! Now this is a molten cake! And the heat from the chile with chocolate is just too good. I can’t believe this only takes 13 minutes! I cannot wait to try this! Oh my goodness. I need these in my life! I can’t wait to try that Patron, too! I’m going to seek some out this weekend. Let me know what you think Sabrina! Oh I have always wanted to make these – delicious!!! Thanks Fareeha — I’m with you on the chocolate! oh my gawd. . the chocolate chile liqueur! 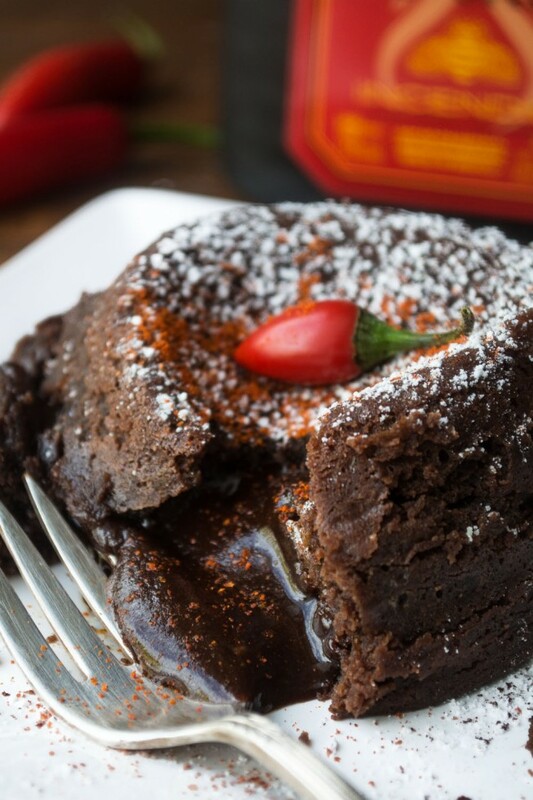 and the pinch of cayenne pepper . . like no other molten lava cake I’ve had before! I love this! I love some heat with my desserts!!! brilliant! Lava cakes are a tradition at our house around the holidays! I’m glad to have a new recipe to try—love the bit of heat and the booze to up the flavor factor! What a magnificent dessert! We are Patron fans so I’ll be looking for this one! Sounds fantastic and is beautiful to boot! 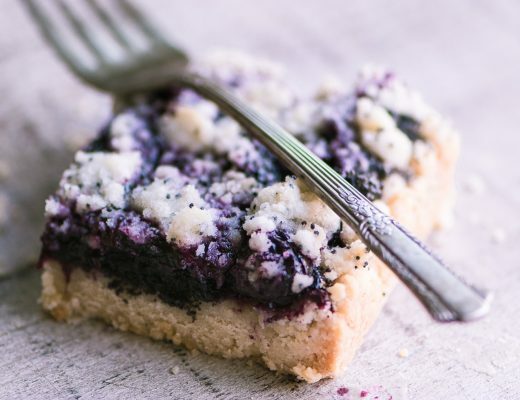 What a great recipe and gorgeous photos! Ok Sue, I’m picking this over a scone hands down!! Awesome! Looks delicious! Hah! I think there’s room for both in this world, Mary Ann! I drooled all over my keyboard, wow that is magnificent. Hi Sue, I’ve only had a molten cake once before and really joyed it. This looks over the top delicious! Love this cake! The new Patron sounds great to give as gifts to those who live tequila! Thanks for a great recipe and for introducing a new tequila! Adina I have to say this cake was so easy and straightforward to make, you definitely should give it a try! What size cups did you use, 4 or 6 ounce. I already have the Patron XO Cafe, love to sip it, but this is a totally new dimention. I used 6 ounce cups, Schatzi. If you already have the Patron you’re good to go!! Wow, that stuff sounds amazing and these molten cakes are gorgeous!! I wouldn’t mind dishing out candy all night long if this was the reward!! Tequila and chocolate? Hello! 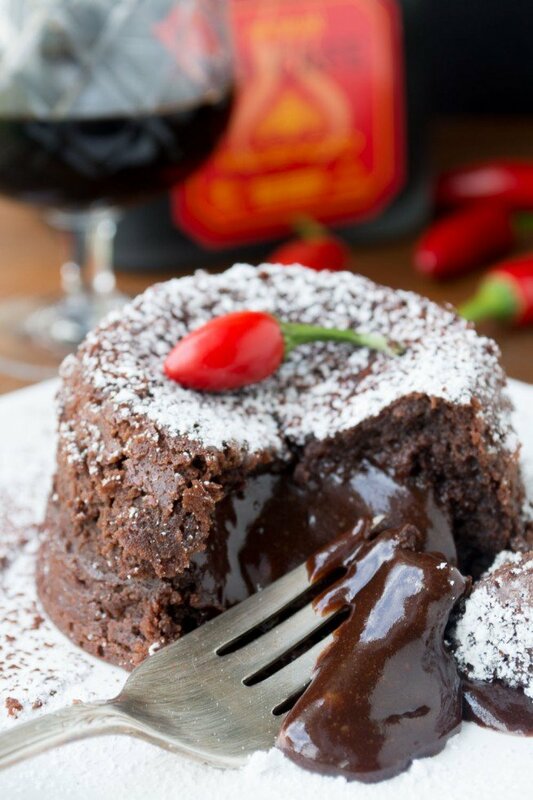 Got to love a classic molten lava cake with a twist! This is my ultimate dessert of all time! Gorgeous photos!! Thanks Liz, it’s probably my favorite dessert too, that half baked chocolate is killer! This looks so good–perfect for a halloween celebration! This looks so delicious I will give it a try. Your photos, as usual, are gorgeous! Ay Dios mio! 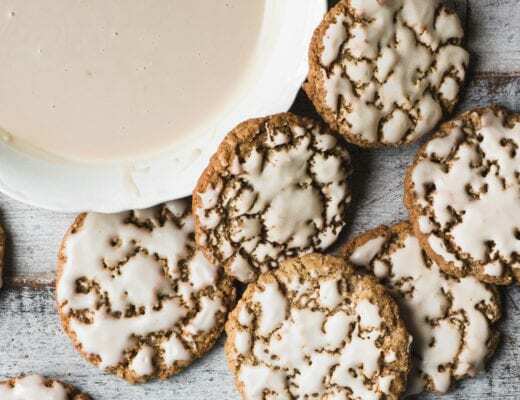 With a dollop of whipped cream – dessert perfection! YUM! I don’t ever thnk of tequila in baking but love the sound of this. And love Patron so it must be fantastic! The tequila flavor is so smooth in this liqueur, we fell in love!